A certain netizen with the name Jose Larry Hermoso questioned the friendship of Kapamilya stars Vice Ganda and Boy Abunda with Queen of all Media Kris Aquino. As an obvious supporter of Kris, Hermoso wrote a lengthy post on his Facebook account. He titled it with “TRAITOR AND USERS”. His post basically attacked the friendship of Vice and Boy with Kris. Hermoso pointed out that amid the scrutiny that Gretchen Barretto is doing to Kris, Boy is silent about it. The netizen said it is because Boy has a manager-talent relationship with Greta. When it comes to Vice, Hermoso criticized how Vice mimics the gesture and voice of Kris in his shows. Here is the post of the netizen. In line with this, entertainment columnist Alex Brosas of Bandera reacted. He said that Gretchen is not now active in show business. Technically, Boy and Greta do not have the manager-talent relationship anymore. When it comes to Vice Ganda, Kris is still friends with her. 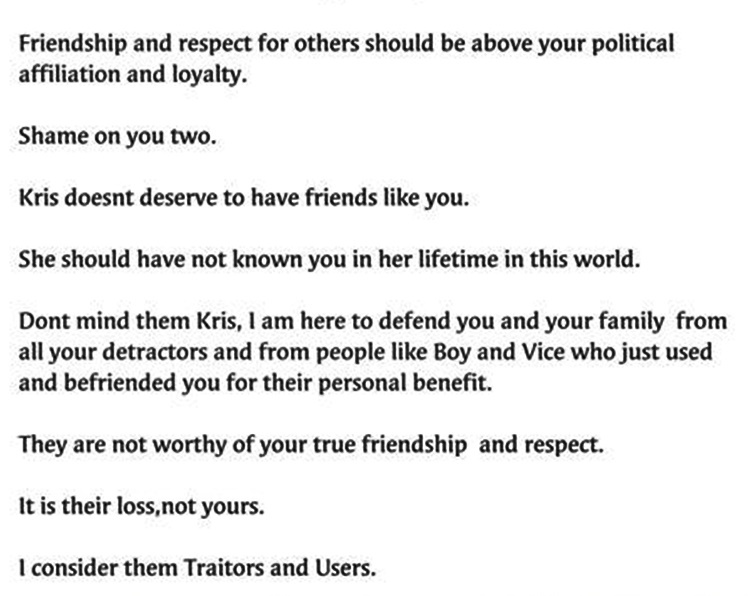 Here are some of the previous articles that prove Kris and Vice are still friends.